Do these come in a range of colours? And would I be able to specify the colours of the cups? Unfortunately this specific cup only comes in blue. 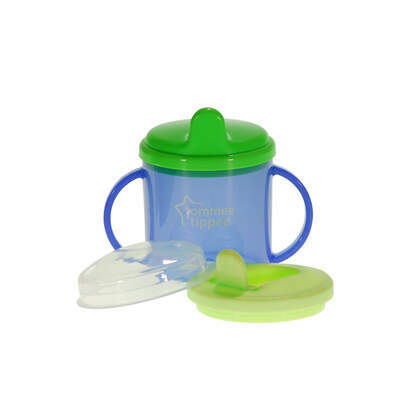 A similar cup would be the Tommee Tippee First Cup (79402), this comes in pink, orange and blue. Although, it is usually a lucky dip for the colours you are sent, but you could potentially ask for specific colours as a special request if needed. Hope this helps! Designed to help transition younger children from a bottle to a cup, the Tommee Tippee Nursery Cup is ideal for nurseries and preschools. Manufactured by a brand leader, this hard-wearing cup features two handles and the option of three different lids. One lid has a fixed moulded spout with three holes, the second is a 'flip and sip' style lid with just two holes and the final is a transparent lid with a single hole. Each lid has been designed as the next step, producing different flow levels and helping children progress through the weaning process. Easy to wash and cleanse appropriately for toddlers, this durable nursery cup is suitable for use from birth and promises to become a firm favourite with every child. Our Baby Feeding category is packed with a wide range of products to suit nurseries and domestic environments. From Baby Velcro Easy Fastening Bibs and Washable Comfi Neck Baby Bibs through to Essentials Feeding Spoons and Tommee Tippee Feeding Bowls, you'll find everything you need here for exceptional wholesale prices.